This is the main premise and definition of the book. Excellent! 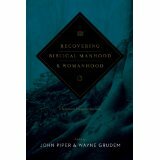 It is a much needed comprehensive book outlining the nature and roles of men and women from a Biblical perspective. Be warned that it is not light reading. The book begins by examining all controversial Scripture passages, not just some, in a scholarly and detailed fashion including Genesis 1-3, 1 Corinthians 11:2-16; 14:33-36; Galatians 3:28; Ephesians 5:21-33; Colossians 3:18-19; 1 Timothy 3:11-15; 1 Peter 3:1-7 and others. Those chapters were helpful, educational and encouraging. I enjoyed the exercises in textual criticism as well, though many may cringe at the tediousness. For those who seek to find extra-biblical basis for sexual role distinctions, the chapters on sociological and biological studies will be very interesting and thought-provoking. A chapter on legal ramifications is included as well. Every conceivable facet of the debate is carefully examined and answered. The only downside for me is that I wish at least one fundamental dispensational Baptist would have been included in the authorship. The Council on Biblical Manhood and Womanhood is one of the more theologically conservative groups in comparison to most of Christendom, but yet is not fundamental nor dispensational per se. For instance, John Piper’s reformed theology does come through in subtle ways, but I can tolerate that since the subject at hand was not impacted by the authors’ views, I still loved the book. While this book may not be a good choice for a group Bible study, it ought to be an essential part of any pastor or pastor’s wife’s library. This book was also reviewed at MostlySensible.com.